That’s the name of this blog. When I first started out I picked this name because I figured I wouldn’t have many minutes to spare and I wouldn’t really update it that much. That was back in early 2010. Since then If I Had A Minute To Spare, if you judge it by the title, has been a testament to my own procrastination, and concrete proof that I really do have too much time on my hands! So what about me? For a while there I was chairman of the Irish Association of Korea, and in the past I was one of the original organisers of the HBC Fest in Seoul. I’m happily married to a wonderful woman who I kindly refer to in the anonymous form, ‘Herself’ not in person of course, only here. She is an insightful individual who encourages me to be the best I can, on condition that the final result is the Nobel Prize. All I can say to that is that at least I’ve made a start. Up until recently it was just the two of us, but now we have our wonderful +1 to keep us busy. Up until the summer of 2014 we shared an existence of married bliss on the twentieth floor of an apartment building in Yeongtong-dong, Suwon. This blog contained instances where I described my life in Yeongtong, but at no time did I attempt to create the impression that Yeongtong is the centre of the universe. Since July of 2014, myself, Herself, and +1 have been living Blanchardstown in Dublin. That’s the real Dublin, as in the capital of Ireland. Slowly we have been settling into life in Ireland, and I’ve been trying to find my Irish blogging voice, and to establish myself in a completely new blogosphere. When I first went to Korea I wasn’t very proud of my nationality, and then I began to meet people from other countries and realised that Ireland is far from the fucked up place I had imagined it to be. Sure, it’s inundated with its own problems and feckin’ eejits attempting to run and ruin things, but these days those feckin’ eejits seem to have been outshone by the stronger Irish people who have refused to allow Ireland regress from the prominent position so many people worked hard to help it reach. People have realised the importance of their voices for keeping the country on its feet, and they listen more than ever. Ireland is a fucked up place for certain, and full of fucked up people, but to be honest, I’d rather be from Ireland than from any other country! Even Herself thinks so, too. 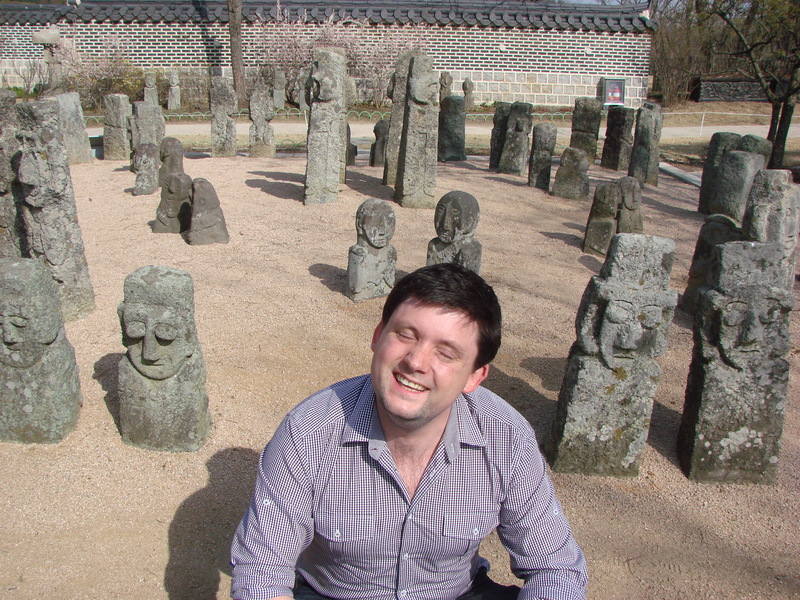 Over the past few years this personal journal of my own experiences, thoughts, and opinions on life, being Irish, being in Korea, being Irish in Korea, and things that just happen, has attracted close to 100,000 visitors. I have made over 300 posts and written an amount of words I couldn’t even imagine counting. This blog has inspired me to write more and more, but at the same time I could blame it for not writing enough. If this is your first time visiting please say hello in the comments, and if you have a blog of your own feel free leave a link for others to click on. Please visit my flickr page for more photographs, as I regularly post there too, or if you’re into it I my instagram account is quite busy, and I’m also on tumblr at If I Had A Minute To Spare #2. If it’s your thing, you can also follow me on twitter. Follow this link to find more of my writing elsewhere on the internet. Follow this link to find my creative writing elsewhere on the internet. All writing, ideas, thoughts, and photography are original material inspired by the world we share. This doesn’t mean you can help yourself. All copyright is owned by me, Conor O’Reilly. I dream to be writer may be we’ll meet us one day and I dream to live in Ireland. Thanks very much for the compliment, and thanks for reading! I’m about to start the ModPo course, just like you. So I guess we can refer to each other as classmates? haha. Nice blog! And I felt like writing cause I really enjoyed what you said about Ireland and how you changed your view about your country going abroad. Same happened to me – I’m from Brazil but living in New Zealand for 2 years now. And I don’t think I was so much in love with my culture and language as I am right now! Yes it’s interesting to actually look back and think why my feelings about this changed. I often wonder if it may actually be related to whether I miss Ireland or not. I hope that if I do move back to Ireland my notions don’t turn head over heals again! Anyway, see you in class! I don’t think it’s because we miss it. It’s because we have now a different perspective. Hopefully we’ll remember that when we go back, eventually! It does bother me a lot, haha. Cool landing page and I especially love the ‘proud Irish’ you. Sometimes we all need to get away to appreciate where we are from. Rejection letters build character … Aren’t we oozing character! Keep at it. You are a fab writer. Thanks very much Móna. Yes, character in spadefuls here, and don’t worry I won’t give up … Yet. can i ask you a favor for a guide to my trip next year? Nice blog site. I am an Australian writer in Dhaka Bangladesh. Mine is http://andreweagle.blogspot.com Check it out if you wish. It was nice to see your site. Cheers! Thanks Andrew. I’ll drop by of course. What do you do in Bangladesh? I taught in Taiwan for two years and Hong Kong for a year and have dreamed about teaching in Korea, too. I only have a BA currently, though, so have been looking at masters programs in the UK and elsewhere. Actually, I want to write more than teach. I’ve been doing a little freelance work in the States since moving home about six months ago. Judging from your most recent post and your “about” section, you have a lot of experience in all of these areas! Glad to find you. I like your site! Hi Jessica, thanks for reading. You don’t need a masters to get a teaching job in Korea, although for university teaching you may – it depends on the university. I’ve found that Korea is a fantastic place for writing, even when teaching, as there are less distractions around (and yes Korea has plenty of distractions). I’ve a wife and daughter to look after these days so making the time to write is proving a bit of a challenge. Lovely blog. I’ll be checking in often.